TACS Members receive Glazed Expressions, a colourful and well-researched magazine also including up-to-the-minute news items, which is published twice a year. TACS Members receive the annual TACS Journal, a peer-reviewed international journal containing substantial articles of original research. Edited by Hans van Lemmen & John Malam, Richard Dennis/TACS, 1991, 180pp, 36 in full colour, paperback The catalogue of the travelling exhibition of the same name, organised to celebrate the 10th anniversary of the Tiles and Architectural Ceramics Society. 18 excellent chapters outline the history of tiles in Europe and the UK, each written by an acknowledged specialist in that field. Fully-illustrated catalogue of the travelling exhibition on European Industrial Tiles, which opened at Boizenburg in August 2004 and arrived at Jackfield Tile Museum in September 2005. The 144-page catalogue, in four languages, has a series of essays on industrial tile production in Britain (by Hans van Lemmen), Germany, Belgium, France and Holland, and shows all the tiles in full colour. John Greene. TACS, 1987. An illustrated book on the use of pictorial tiles in children’s wards. Published posthumously and with permission of the Author by TACS in 2018. Available as a free download. Substantial report is currently available as a free downloadable PDF. Full list of Powell’s of Whitefriars opus sectile locations available as a free download. The list was compiled by Dr Dennis Hadley during private research at the Powell’s of Whitefriars archive held by the Victoria and Albert Museum, Archive of Art and Design. 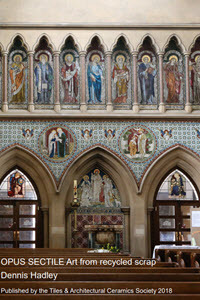 The papers given at the Tiles and Architectural Ceramics Society Conference ‘Church Ceramics: Decorative tiles, mosaic and terracotta during and after the Gothic Revival’ are available as free PDF downloads.